I’ve started a new project called “Geremy’s Peculiar Week” where I capture moments from my week and edit them down to a short video montage. These episodes aren’t meant to explain my activities during the week—they are intended to give short snippets of my experiences. When deemed necessary, longer journal editorials containing further details will follow each episode. As of right now, my intention is to create a video on a weekly basis, but we will see how that goes! It’ll be interesting to share these videos and journal entries with my future kids so they could get a better insight into what their dad was like in his 20’s. It’ll also be quite scary to imagine “Family Man Geremy” looking back on “Single Man Geremy.” Very scary. I feel like this entry needs some sort of a disclaimer, but I’m not sure what this disclaimer should say! A few weeks ago I stopped by my investment property at night and something told me to go into the basement. As soon as I opened the basement door, I heard a big splash of water. I was puzzled so I walked around the basement to identify the cause of the water and I saw that the sewer line was backed up and flushing into the basement. Immediately I realized that I was in a crappy situation (no pun intended). Since purchasing my house in 2008 things have been going very well. It was renovated a couple of years prior to my purchase, then I upgraded various things two months after buying it. With all of this renovations, things were in very good condition and I haven’t had any serious issues to deal with. Unfortunately, a backed up sewer line became my first pretty serious issue and when I discovered it my day went down the toilet (no pun intended). I called my dad, who seems to be an expert at everything, and told him about the issue. He calmly suggested that I get an auger and snake the sewer line. The following morning at 6am I got triple coated rubber gloves, old boots and old ill-fitting clothes (all of which would need to be burned in a sacrificial bonfire after this sewer episode) and I went into the basement with a 25ft electric auger. I took the cap off the sewer pipe, which caused its contents to flood onto the floor of the basement, and I fed the auger line into the pipe. The entire line went as far as it could into the sewer pipe and did its drain-clearing job but there was no clear indication on whether or not this removed the sewer backup. Simply put, the entire procedure was a crapshoot (no pun intended). After I went home and threw my clothes and boots into the trash, I took a very long shower. I went to work that day and then returned to the property in the night to see if everything worked out. It turns out that that the blockage wasn’t completely cleared and I needed to get a more powerful auger. This meant that it was time for attempt number-two (no pun intended). My dad gave me his second, industrial-strength auger to use. This auger was equipped to handle the biggest situations. It had enough wire in it to clear the entire sewer line of the whole city with as much power as the engine of a Bugatti Veyron Grand Sport. When I fed it into the sewer, it cleared the entire line within 20 minutes and revealed the cause of the blockage, which was a weird object the size of a stool (no pun intended). After clearing the pipe, I bought several gallons of clorox and I used it to completely disinfect the basement. I also had to make sure that there were no visible or fragrant reminders of this horrible episode. After several days of cleaning things, I was finally done and I took a very long nap to rejuvenate my energy—so I guess you can say that I was pooped (pun intended)! Now it’s all over and I’m happy! I welcome the next challenge, as long as it’s not sewer related! 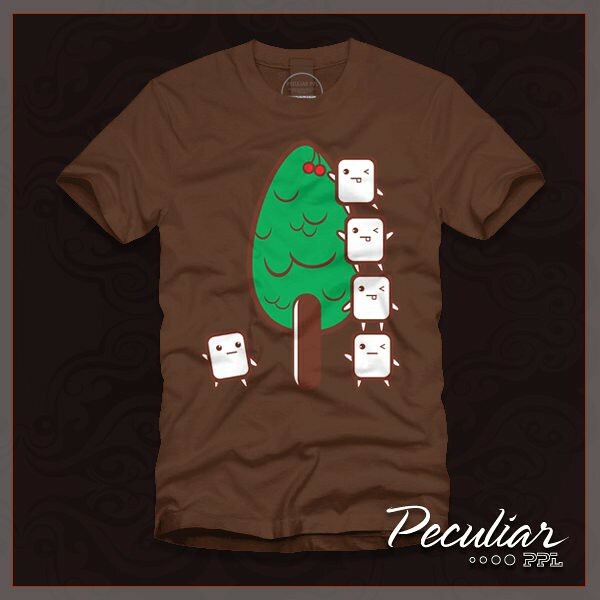 Ever since establishing my brand, Peculiar PPL, in March it has been an absolute joy figuring out ways of taking it to the next level. 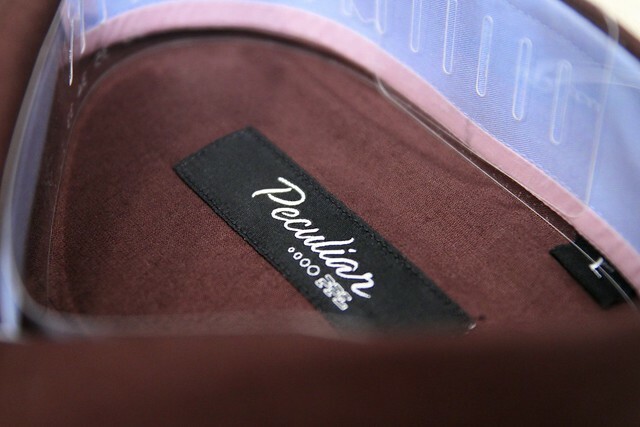 The brand evolves daily as I take a granular look at every detail and analyze ways of improving it. Now that it has been almost eight months since launching the brand and six months since launching the first product, I would like to share a few of the changes that have taken place. Ever since I was in fifth grade, I’ve had the vision of having one company that would make everything from automobiles to bread makers. In my 10 year old mind, I envisioned the company being named “G for Me, LLC” but the name sounded more and more juvenile as time progressed. Peculiar Enterprises seems better to me! One of my goals from day one was to have the best, most efficient packaging and shipping systems ever. This was initially a huge struggle for me because I couldn’t seem to get things correct. Our initial shipments were packaged in corrugated boxes that left about 1/2 inch of “breathing space” on the sides and 3/4 between the product packaging and the top of the box. This caused about 20% of the shipments to look sloppy when they were delivered to the customer. In addition, each corrugated box weighed between 8 oz on its own, which led to a cost of $2.39 just to ship an empty box across the United States. I changed the packaging to use a high-quality bubble mailer envelope, which was sturdier, more flexible and could keep the product packaging safe during shipping. These mailers cost pennies on the dollar to purchase and weigh less than one ounce when empty. This economical mailer allows us to include more surprises in each package without having to worry about a large increase in the cost of shipping, or potential damages to the product packaging. Initially all orders were mailed via the post office which added a lot of ugly, randomly placed “PRIORITY DELIVERY” and “DELIVERY CONFIRMATION” stickers to the package. Also, since I drove to the post office to ship each package, this increased the cost per package when considering the cost of gas, cost of personal time and the lack of a discounts offered by the post office. I strongly disliked this method, mainly because of the roller coaster of emotions displayed by the post office lady (ranging from extremely happy to near-menacing), so I needed to find a better way. Since I reduced the handling time and improved the cost of shipping materials and postage, I reduced the cost of shipping from $5 per package for a domestic shipment to $2.50 per package. There are some cases where the shipping cost to me will exceed $2.50, but I’m fine with this and I won’t pass the extra cost along to the customer. Also, I have reduced the cost shipping cost to $0.00 when the customer purchases 3 or more items. No one likes paying high shipping costs, so I didn’t want this to ruin the entire Peculiar PPL experience. From day one, we have had very peculiar product packaging. I’ve always wanted a unique product package because this has always been my favorite part of any shopping experience. 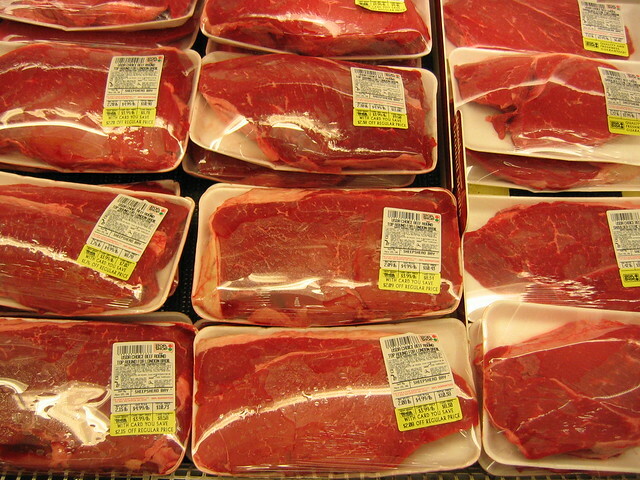 After researching many different product packaging options, I settled on packaging each product like a slab of meat from the supermarket. Why a slab of meat? Because it’s Peculiar! 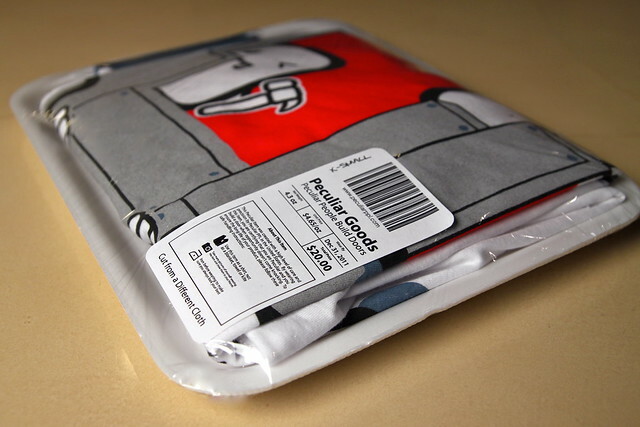 Each shirt is carefully folded, placed on a meat tray, wrapped with plastic meat-grade film, labeled with a “new-generation” version of the meat label (including information about the product, operating instructions, and “wear by” dates) and shipped to the customer. Initially each product included a barcode that was encoded with the words “Peculiar PPL” and didn’t really do much. Now, I have changed the barcode to be a QR code that is readable by smartphones, which either takes you to the Peculiar PPL website, the Peculiar PPL Facebook fan page, a unique webpage that includes a special offer for a future discount, or a webpage where you can get a free Peculiar PPL item. I did this because I loved “Willy Wonka and the Chocolate Factory” where there were randomly placed golden tickets in the packages of chocolate and I wanted to add a Peculiar twist to the concept. Note: I have not (and will not) ever instruct the customer to scan these codes with their smartphone. As I shipped the items to the customer, I began including random little surprises in the package. As of today, haven’t been any two packages with the same surprise(s) as another package. I will never publicly reveal the tiny surprises included with every order. To date we have three designs printed on seven different shirts, ten designs ready to be printed and five designs in the works. The first t-shirt included a graphic of little Peculiar PPL building a door on the front and on the rear it prominently displays the sentence “When opportunity doesn’t come knocking, Peculiar PPL build a door.” After I wore this shirt around for a while I decided that I didn’t want the future shirts to be as self-explanatory and instead I wanted the shirt to initiate a dialogue rather than complete a monologue. Therefore, I made changes with the future designs. I decided that each shirt will include a brief phrase on the back, like “Peculiar PPL Conquer Obstacles” or “Peculiar PPL Soar to New Heights” and it will include a quick illustration of this concept on the front. If people are still intrigued by this concept, they can ask the person wearing the shirt for further explanation and that person should be able to provide more guidance. I am working on including some form of literature or “concept aides” with orders to explain the thinking behind each design. After creating the line of dress shirt designs, I have been wearing them regularly and am still in love with them. This has inspired me to create additional products as product line extensions. Unfortunately, these products that I have in mind aren’t easy or cheap to make, but I won’t give up until they’re a reality. More details on this later! Ever since I was able to write my name at the age of two months old (I was a high-functioning baby…don’t ask), I wanted to create a stationary line. I’ve always wanted to make extremely high quality writing tools and accessories for the common folk who prefer not to pay $2,000 for a MontBlanc pen. Recently I started navigating into this arena by creating a line of notebooks. I have been beta testing a variety of additional stationary products and will have a more things available after they pass my rigorous testing standards. The first Peculiar PPL website was created in a hurry because I wanted to meet my self-imposed launch deadline. On the week of the deadline, I locked myself in my lab between the hours of 7pm and 2am every day and learned a new programming language for the content management system called Joomla. Eventually I roughed together enough code to make the site functional, but I’ve hated it since the day after we launched. I didn’t hate it like how little kids hate broccoli…I hated it like how the United States hated Osama Bin Laden, and I avoided going to my own website just sso I wouldn’t have to look at it. Although the website appeared to be fine, I saw that it wasn’t nearly as great as it could have been, so I just started over. I recoded the entire website over from scratch and didn’t launch it until I was satisfied with how it turned out. The first page of the site is intended to be a “window shopping” view of all of our products. The website visitor could simply look at the screen and see every product that we have for sale, along with a snippet of our first three blog entries without clicking anything. If they are still interested, they can click any product image to see more information and additional views of any product. If they are interested in purchasing the product, they can click “Purchase this Product” from the homepage and they are taken directly to the product that they just saw. In addition, the website includes a lot more content for people who are Peculiar but do not wish to purchase anything. 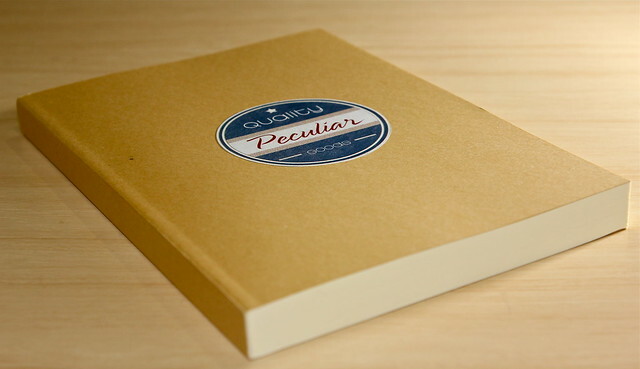 It includes videos, quotes, articles and Peculiar PPL brand updates. I am a lot more satisfied with the website now and it is constantly in development to add more features. This has been an explanation of some of the major things that have been keeping me busy nowadays, hence the lack of significant journal entries over the last few months. Although I still have not started to do any significant marketing besides word of mouth to my friends, I have been contacted by individuals interested in selling the product in boutique stores. Peculiar PPL has been my hobby and I am having a lot of fun with it— I am just excited that I can bring people along with me on the ride. I get excited every time I see someone wearing a shirt that I designed and I am happy that my dream can be shared with others in a tangible way. Thank you! Laptop died, which threw off the whole proposed posting schedule. The geniuses at the Apple Store were able to revive it and now I have it back in my possession to resume posting. Entries coming soon! Every Friday night I teach a class of high-potential youth and although each kid in the class is extremely bright, there are three who stand out. I admired their consistency and determination, so last week I treated them to a day of fun away from their usual environment. 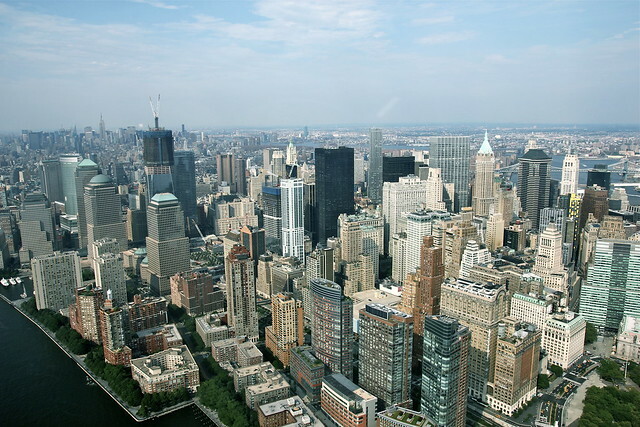 Our first destination was New York City for a cruise around the island. During the 90 minute cruise, an earthquake took place and we didn’t feel it at all, so we basically owe it all to the essentials kit. If we were not equipped with three essentials kits, I don’t know what would have happened!! 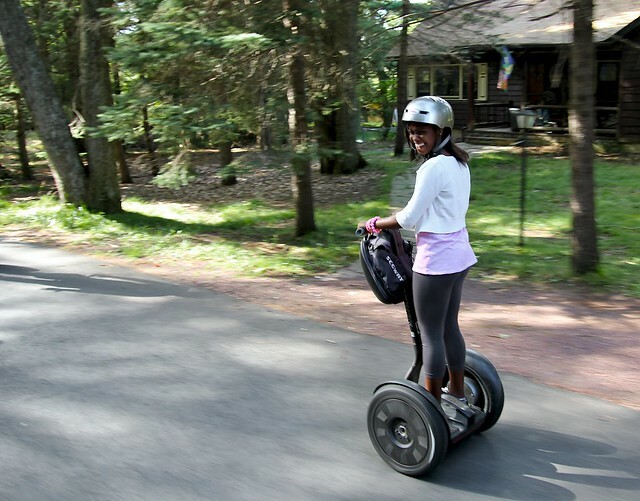 We then drove up to Pennsylvania for a Segway tour of the Split Rock Resort. 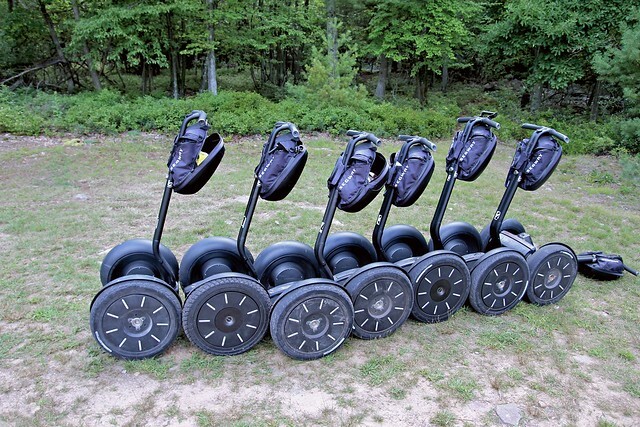 When they first saw the Segways, they were initially very scared of this magical machine that seemed to be controlled by the power of the mind, but after a thorough walkthrough by the tour guide and lots of practice in the parking lot, they were driving like professional mall cops! During our drive around the resort, we were approached by a deer, who just stared at the Segway with a bewildered expression. We were also chased by an angry dog with a bad hip. The chase lasted for about five seconds, then the dog gave up so to rest its tired hip. We were safe and drove without any accidents until the last five minutes of the tour when we began to accidentally crash into things. My prior riding experience with the Segway didn’t help me much because I was the first person to crash and be thrown from the machine. 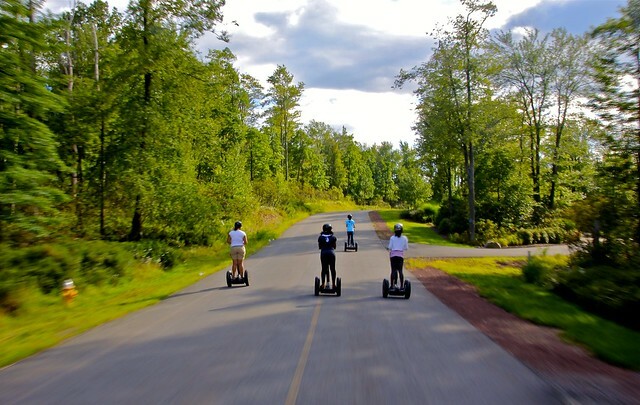 I was riding along a bumpy path when I got the brilliant idea to accelerate at full speed into a rock, just to see how the Segway would react. Segway didn’t like this too much because it applied the brakes to the left wheel and accelerated the right wheel. I stepped off the machine to regain balance, but this caused it to flail around like a fish on dry land. I jumped off the machine and held onto it so it wouldn’t drive into the lake, but then it proceeded to DRIVE UP my leg. Ouch! Minutes later, two of the girls’ Segways touched wheels andcollided and the scooter didn’t like that too much either. Two minutes later, someone else’s Segway freaked out when she lost balance on the machine. This was a sign that we needed to end our Segway day. The machines didn’t like us anymore, but thankfully no one was even mildly injured. On the drive back to New Jersey the girls used the opportunity to make friends, so they waved at the cars passing by us during our 70 mile journey down the highway. I realized that they made lots of friends when I looked at the cars around me and noticed that the people were trying their best to keep the same pace as me so they could wave to them again. I guess their plan worked. The waving ended when we entered New Jersey and the infamous NJ car drivers/passengers didn’t want to even crack a smile. As the day came to an end, we went for ice cream and I returned each child to her home in one piece and without any damage. 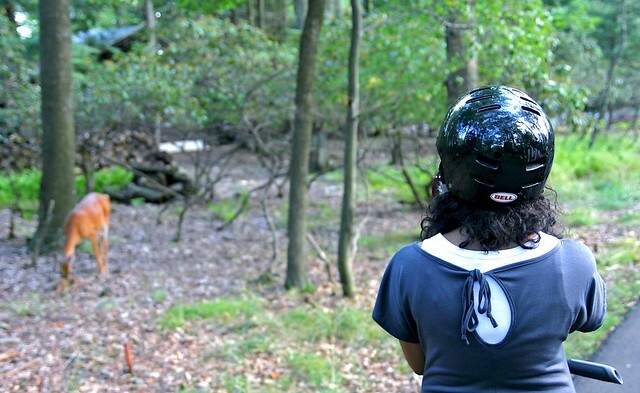 This experience was great because through it I was able to discover the secret to a smooth fatherhood: as long as my kids have an essentials kit and a helmet, it’s all smooth sailing! I’ve had a love for the fine art of negotiation for most of my life and most recently I’ve developed a newfound love for convertibles. In the back of my mind I feared that these two loves would intersect and yield bad results, but after my recent unexpected experience at a car dealership, I realized that these two things can come together to produce sweet, sweet harmony. 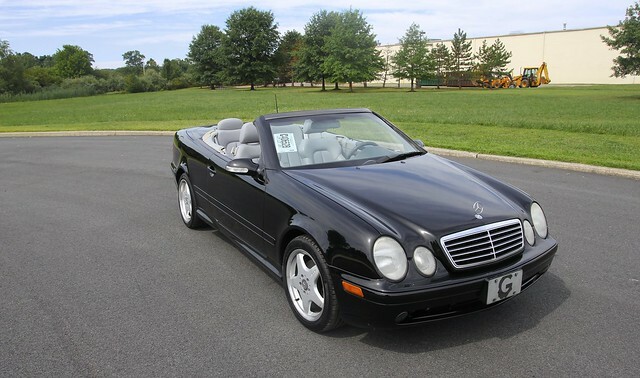 When I returned home later that week I was inspired to recreate the experience in my daily life and purchase a convertible, but after 3 months of searching for the perfect vehicle at the perfect price, I abandoned my quest. Fast-forward to a couple of weeks ago, I was driving by a car dealership and I spotted a gorgeous Audi S5 for sale. I stopped to admire the quad-exhausted beauty when in the corner of my eye I noticed a lonely little convertible parked out back. When I asked the dealership’s owner about the car, he told me that he just accepted it into his inventory earlier that day and it wasn’t ready to be sold yet. I inquired about the cost and he told me that he did not yet calculate the cost of the vehicle so he’d have to get back to me. I realized that this was the perfect opportunity for a negotiation session so I made an extremely aggressive offer for the car and to my surprise he said “ok.” “Wait… You mean ok, as in ‘yes, you accept my offer? '” “Yes.” This was too easy. I thought about capitalizing on my luck by offering him $100 for the Audi S5, but I decided to be modest. While he retrieved the keys for me to test drive the car, I used my iPhone to check the car’s value on every major car valuation website that I knew and they all suggested that, at minimum, the car was worth at least 40% more than my accepted offer. I assumed that the owner also did the same thing because when he approached me again, he tried to correct his mistake and increase the price by 30%, but it was too late and he realized this too. I’d already mentally purchased the car. I took the Mercedes CLK430 for an extreme test drive where I subjected it to my battery of extreme tests. I rapidly swerved to test the suspension, I slammed brakes several times to test the pads and rotors, I accelerated from 0-60 multiple times to see how much the engine could handle, and I even blasted the sound system at full volume to see if it could handle my loud hippity-hop music. I tested everything from the wipers to the headlights and everything passed my tests with flying colors. The guy from the dealership who accompanied me on the test drive probably feared for his life as I drove like The Stig, but I wanted to be sure that I fully tested the vehicle that I needed in my life all of a sudden. When I arrived back at the dealership, I prepared for round two of negotiations. In the process of negotiating further, I became friends with the owner of the dealership and we spoke for a while about things not related to the car deal. He told me stories about his vacation, he showed me pictures of his wife and kids, introduced me to his business partner and his kids, and introduced me to other members on his staff. In the process of speaking with him, he showed me the exact profit margin for the car and explained how he is earning less than $50 on the sale, but he was happy because the customer relationship aspect was a lot more valuable to him. During this deal I realized that the word-of-mouth potential of a sale is often more valuable than a one-time quick profit. I liked this deal because everyone wins: I got a car that exceeded my expectations and he gained a customer and numerous referrals for life! So now I have a car that is emblazoned with my G-Head logo, just like the first one. Best of all, I got it a week after my birthday, so it also serves as a birthday gift from-me-to-me. I love this car so much that I want to take it behind the middle school and get it pregnant. Summer needs to last longer! 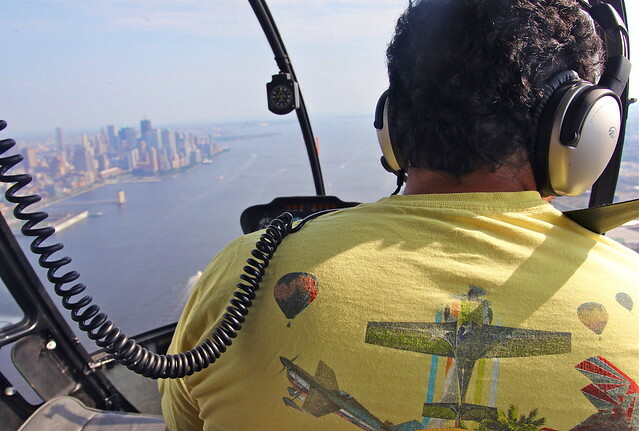 I recently had my first helicopter experience when I went on a flying tour of New York City. After signing a liability form with multiple lines of “don’t sue our company, please” fine print, the flight instructor guided my friend and I down the tarmac where the helicopter was kept. While we walked, I took the opportunity to ask the pilot a very important question. “So how many years have you been flying?” “Two.” “Did you say two years?” “Yes, two years.” Oh boy, what did we get ourselves into?! Somehow the liability release form coupled with the novice helicopter pilot didn’t instill a warm and fuzzy sense of security in my nervous heart. Was it too late to back out?? The helicopter pilot then ushers us into a tiny blue dragonfly looking contraption that was the length of 1.5 Geremys. 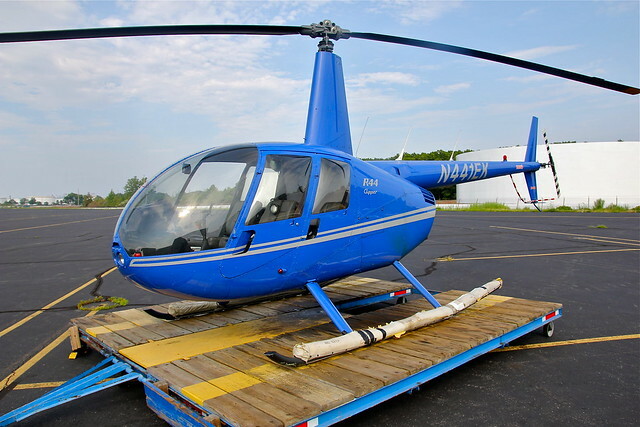 I thought that it would be a very cool toy for my brother to play with, but then our pilot said “this is the helicopter that we will be flying in today.” Wait…this blue insect thing is a helicopter?!? At this point, the “don’t sue us” form, coupled with the beginner helicopter pilot and the 9 ft long dragonfly did not give a sense of security to my palpitating heart. Was it too late to back out?? Pilot man explained the rules of the dragonfly: 1) don’t walk behind the fly 2) don’t walk around the fly if its wings are flapping 3) don’t step on the fly, and 4) don’t try to leave the fly while the fly is in motion. This seemed easy enough. As extra incentive, he explained that breaking these rules could lead to injuries, which probably include decapitation and/or loss of limbs. Now I realized why the release form was necessary. We climbed into the fly’s belly and fastened our seat belts to ensure that we don’t fall out. I assumed that the pilot was going to prepare for the flight by wearing some helicopter-piloting gear, like maybe some sort of life vest and perhaps a helmet, but I was horribly mistaken. His helicopter flying outfit consisted of a t-shirt that had three planes free-falling out of the sky. Next, he turned on the helicopter (which sounded a lot like my dad’s Craftsman weedwacker) and he whisked us into the air. When we were about 20 feet above the ground, I noticed that he had no front door and could easily jump out of the helicopter and abandon the flight if he wanted to. Uh oh..
After we were in the sky, the fly went surprisingly smooth and the views of everything was simply amazing. 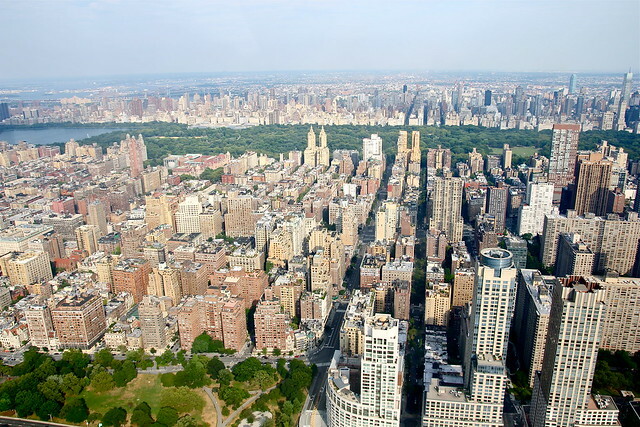 It was great to see the entire city of New York from a completely different vantage point. I was eye-to-eye with skyscrapers and I felt like King Kong. I continuously snapped photos of everything I saw because I did not want to forget the amazing view. 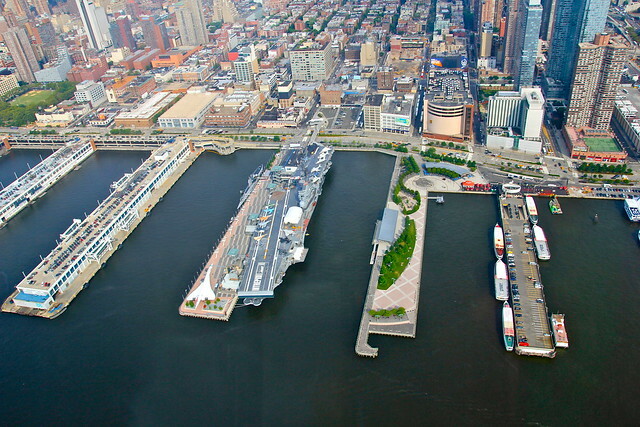 As we reached the end of Manhattan, the pilot turned the fly around and showed us one of my favorite New Jersey cities—Hoboken. He pointed out a few things that were only visible from the sky, such as rooftop pools and gardens, but then I realized that he was steering the entire helicopter with one hand as he spoke. I wanted to mention that I didn’t feel that he was experienced enough to attempt the one-hand-flying routine, but since he didn’t have a door I didn’t want him to get offended and jump into the Hudson River. We passed by the Statue of Liberty then we crossed over Newark Airport before landing in the same spot where we started. As I exited the dragonfly, I wished the the flight was just a bit longer because it was truly a great experience with great sights. Although I signed all of my rights away on a waiver form, and I flew in a helicopter that was smaller than the glove compartment in a Mini Cooper, and I put my life in the hands of a relatively new pilot, and I risked decapitation, it was a very enjoyable experience that I would partake in again if I was given the opportunity. Coincidentally, two days later I received an email from the company’s mailing list which stated that flights were postponed indefinitely due to mechanical issues. I don’t know if this was due to the pilot or the dragonfly or the lack of a front door, or the risk of decapitation, or the weedwacker engine, but I am happy that it didn’t happen on my flight so I could live to tell this story about the time that I was eye-to-eye with the sky. Last Wednesday and I turned 26 years old. Give me a minute to let that sink in…. Twenty-six. Wow. Launching a product line of Peculiar goods. In addition, designing and releasing nine new products within three months of opening. Also, receiving an offer to have these goods sold in a NY boutique store. Spending one month traveling to 5 different states to find inspiration in the coolest places that I could find. …and many, many more things! I would like to thank everyone who was present in any capacity during the last few months of my life. I consider myself extremely blessed and fortunate to have the great opportunity to have these experiences at the relatively young age of twenty five. I know that I did not accomplish these things with my own power, so I can’t take any of the credit for anything. My main goal in life is to use myself to inspire others and if I’ve done this for anyone in any capacity over the last 12 months, then my goal is working-out well. If I haven’t, that’s fine also because I’m a work in progress. I am motivated to grab age 26 by the horns and wrestle it into submission, but first I feel the need to give myself a happy birthday gift to myself from myself to tell me, “I’m proud of you, self.” I wonder if Pluto is for sale?? While I was finalizing the artwork for this “Peculiar PPL Conquer Obstacles” shirt, I grew increasingly frustrated because I wanted to communicate a variety of different encouraging messages, but I did not want to bring clutter to the shirt’s design. As I brainstormed solutions, I decided that it would be a good idea to take the Peculiar PPL art beyond something that you can see— I wanted it to be something that you can also hear and feel. This led me to a conversation with a good friend to whom I presented the idea of doing a Peculiar Music project that takes the visual art and communicate it in the musical form. In just a matter of moments, the Peculiar PPL Music Art project was born! I dug out some of my audio recording equipment that I collected when I had aspirations of being the next Pharrell (I would’ve called myself Farrell) and we met to record the first single. I was the producer for the project and he was the rapper— a talented first-time recording artist who was able to record final versions of his main vocals, backing vocals and ad-libs in just under two hours. After finishing the studio session, I spent the next two weeks listening to the song over 100 times, arranging new instrumental tracks, tweaking vocals, mixing the audio tracks and trying to get back in the swing of producing again. In the end, we came up with a track called “I’ll Make It,” which, coincidentally, was the same phrase that I kept repeating to myself when doubt entered my mind and tried to convince me that there’s no way that we could finish the song. I hereby present to you “I’ll Make It,” which is the first song arranged for The Peculiar PPL Music Art Project: Volume 1.